Make your Childs party one to remember! Mr. Balloon Wizard is the most popular kids performer! Since Mr. Balloon Wizard is also a special events coordinator he offers free advice for your party! A Childs birthday is like Christmas to them. Mr. Balloon Wizard understands that and this special magic show will be remembered for years to come! This is a fun interactive show with real illusions! Depending on the ages and the occasion, the show will change to make it special for you. 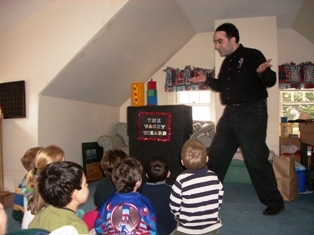 Your child will be a special assistant to the magician. Show 40-50 minute show for the whole family for ages 3 to 103. Mr. Balloon Wizard also has a Magic Workshop, where the children become magicians! This is great for children from 7 and older. These are between 40 minutes and an hour depending on how many children are at the event. Steve the Balloon man also has a Balloon twisting workshop! Again great for 7 years and older. They are 40 minutes to an hour as well. Combo show for 7 years and older. Mr. Balloon Wizard can combo a mini show with a mini workshop as well. Either a show with magic workshop, mini show with Balloon workshop, or Magic workshop with Balloon workshop. All shows are fun and interactive and are the highlight of your event!